Many professions are plagued by disparities in service delivery. Racial disparities in policing, mortgage lending, and healthcare are some notable examples. Because disparities can result from a myriad of mechanisms, crafting effective disparity mitigation policies requires knowing which mechanisms are active and which are not. In this study we can distinguish whether one mechanism—statistical discrimination—is a primary explanation for racial disparities in physicians’ treatment of patients. In a longitudinal natural experiment using repeated quasi-audit studies of medical students, we test for within-cohort changes in disparities from medical student behaviors as they interact with white and black patient actors. We find significant increases in medical students’ disparate behaviors by patient race between their first and second years of medical school. This finding is inconsistent with statistical discrimination predictions and challenges the idea that statistical discrimination is primarily responsible for racial disparities in patient care. Rubineau, B. & Kang, Y. (2012). 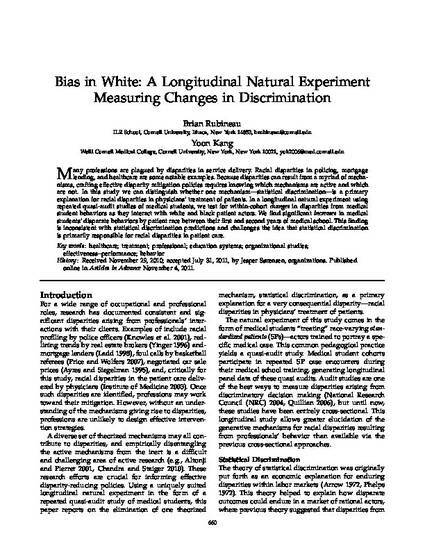 Bias in white: A longitudinal natural experiment measuring changes in discrimination [Electronic version]. Management Science, 58(4), 660-677.